There are good Adirondack ski days and then there are days when it would be an insult to nature to not get outside and ski. So far, every day this week has been one of those don't-insult-Mother Nature days in Lake Placid. Fortunately, I enjoy out-the-door access to some of the best cross-country skiing in the world: the Olympic ski trails at Mount Van Hoevenberg, in Lake Placid. Cross-country skiing at Mount Van Hoevenberg has been absolutely superb lately.The world-class grooming crew has been hard at work creating some of the best skiing in recent memory. If you are a cross-country skier and have not skied at Mount Van Hoevenberg (MVH), then you might consider adding a visit to the Olympic trails to your bucket list – and do it this year. If you've never skied and always thought you might like to try cross-country skiing, MVH is great place to stop procrastinating and give it a go, right away. The urgency you might sense in my advice is because cross-country skiing is extremely weather dependent and the Adirondacks are enjoying the deepest base seen in years. Carpe Diem, as they say. 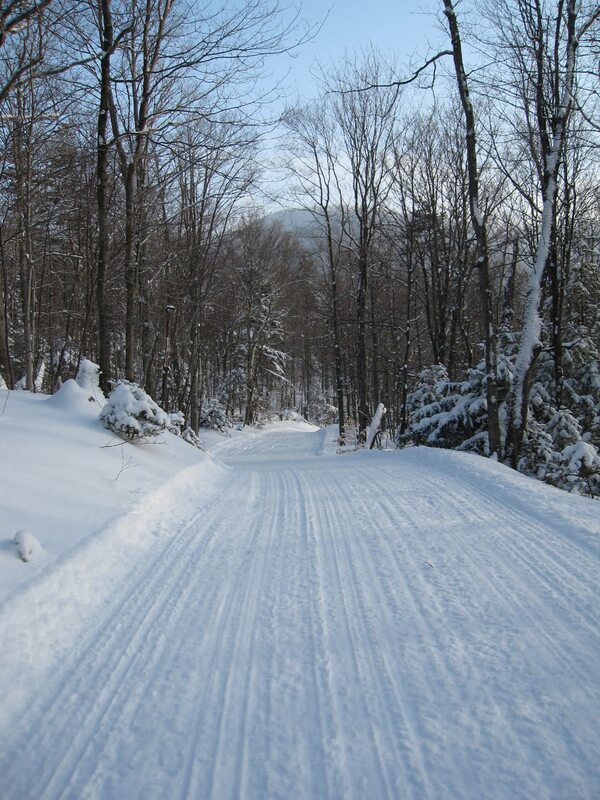 Located just five miles southeast of the Village of Lake Placid on NY State Route 73, Mount Van Hoevenberg , or the "Olympic Sports Complex" in Lake Placid Olympic parlance, was the site of the 1980 Olympic Winter Games cross-country skiing, biathlon, and sliding events. 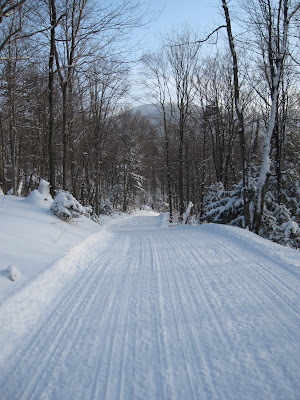 Obviously, these beautifully maintained ski trails and the refrigerated bobsled/luge track were built into the side of a real Adirondack mountain since skiing, bobsled, and luge rely heavily on gravity and elevation change. Fortunately, these rules of physics do not discriminate and they allow us mortal recreational skiers to also have a blast at Mount Van Hoevenberg. Having a blast on skis is exactly what this season has delivered. Because the trails are perfectly groomed and we've had plenty of snow, it is tuck-and-go conditions on all the hills. There is nothing quite like putting skinny skis in perfectly set tracks, (like little train tracks) that take the fastest line down a nice, steep and long downhill. On a cold day it is particularly handy to descend in a tucked position and use gloved hands to cover your face on the windy downhills. In addition to offering a great ski workout or an excellent first time ski experience, cross-country skiing at MVH is also a treat for the eyes, heart, and soul. The breathtaking mountain views and rejuvenating effect of spending time outdoors in the Adirondacks are legendary. 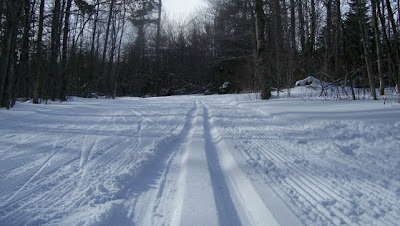 The area boasts 50 kilometers of trails, groomed for classical and skating techniques. The impeccably groomed, Olympic caliber cross-country system offers skiers of all levels a full array of options based on difficulty, from beginner to expert-only racing trails. The facility at MVH provides equipment rentals, a sports shop, café, and PSIA-trained staff to provide private or group lessons. Mount Van Hoevenberg is open daily throughout the winter. If you are looking for something fun, healthy, and sublime to do in honor of the holiday of love, consider a weekend of skiing your heart out at Mount Van Hoevenberg in Lake Placid. I am just a beginner in the world of cross country skiing but I will add this one to my list of places to go. There's a Storm Coming, Boys and Girls!